For eight days, Chanukkah honors and celebrates the historic victory of the Maccabbees and the miracle of the oil. Chanukkah or the Festival of Dedication is also called the Feast of Lights. An eight-day festival beginning on the 25th day of Kislev, the holiday commemorates the victory in 165 B.C. of the Maccabees over King Antiochus Epiphanes and the rededication of the Temple in Jerusalem. Spelling-- The Hebrew word Chanukah means "dedication," and has only five letters in the original Hebrew. In English there are at least 16 ways to spell it, including: Channuka, Channukah, Chanuka, Chanukah, Chanuko, Hannuka, Hannukah, Hanuka, Hanukah, Hanukkah, Kanukkah, Khannuka, Khannukah, Khanuka, Khanukah, Khanukkah, and Xanuka. From history we know that the Kingdom of Greece replaced the Kingdom of Media-Persia. The first King of Greece was Alexander the Great. At the zenith of his power, Alexander died. Two of the four Kings that replaced him were from the Ptolemaic dynasty based in Egypt and the Seleucid dynasty based in Syria. Toward the end of the Greek rule, Antiochus IV arose from the Seleucid dynasty. He declared himself Antiochus Ephiphanes (“God Manifest”). Behind his back he was called ‘epimanes,’ meaning madman. In the 2nd century BCE, the Syrian-Greek regime of Antiochus sought to pull Jews away from Judaism, with the hopes of assimilating them into Hellenism -- Greek culture. Antiochus outlawed aspects of Jewish observance -- including the study of Torah -- which began to decay the foundation of Jewish life and practice. During this period, many Jews began to assimilate into Greek culture, taking on Greek names and marrying non-Jews (that's what happened in my family...). During the years 171 – 165 BC, Antiochus perpetrated a holocaust against the Jewish people. He outlawed Judaism, and ended the Temple sacrifices. In 168 BC, he committed an abomination of desolation against the Temple by sacrificing a pig on the altar and erecting an image of Zeus, which looked very much like Antiochus himself! Not being satisfied with this, his forces spread out all over the country forcing the Jewish people to sacrifice swine and punishing any who would even circumcise their children with the penalty of death. In a town called Modin just south of Jerusalem, there lived an aged priest named Matitiyahu with his five sons. When the forces of Antiochus came in they demanded that Matitiyahu sacrifice a pig. Mattathias, being a righteous man, simply refused. As a crowd gathered the tensions built up to the boiling point. Then, out of the throng, came a Jewish man who was willing to sacrifice the pig just to placate the enemy and relieve the tension. Matitiyahu was so angry at this treachery, that he killed the man and then with his five sons killed the henchmen of Antiochus. Matitiyahu then bade ‘all who are zealous for God,’ to follow him. With that Matitiyahu and his sons went into the surrounding hills and began a guerilla war, which lasted several years. In the process of time Matitiyahu died. His eldest son Judah, known as the ‘maccabee’ (lit. hammer) for the way he fought, began to lead the group, which henceforth bore his nickname. In the face of vast superior forces, the Maccabees miraculously routed the Syrians and drove them away. Antiochus sent thousands of well-armed troops to crush the rebellion -- but the Maccabees succeeded in driving the foreigners from their land. In what we commonly now call December -- 165 BCE, Judah and his followers liberated Jerusalem. The Holy Temple was in shambles, defiled and desecrated by foreign soldiers. They began cleansing the Temple. On the 25th day of Kislev, they re-dedicated the Temple to the G-d of Israel. When it came time to re-light the Menorah, they searched the entire Temple, but found only one small jar of oil bearing the pure seal of the High Priest. Miraculously, the small jar of oil burned for eight days, until a new supply of oil could be brought. From then on, Jews have observed a holiday for eight days in honor of this historic victory & the miracle of oil. Counting the time from the beginning of the persecution of the Jewish people by Antiochus in 171 BC to the rededication in 165 BC was exactly 2,300 days. G-d kept his promise to the day! (According to Daniel 8:14, the Temple was to remain desolate for exactly 2,300 days). Judah and his followers declared this to be an eight-day feast and to celebrate it annually. Rabbinic tradition tells us that Chanukkah was declared to be an eight-day feast due to the fact that one day’s provision of oil burned for eight. While I personally believe this, the original reason Chanukkah was set as an eight-day feast--the holiday just missed had been Sukkot (Feast of Tabernacles--Lev. 23:33-43), an eight-day celebration. In fact, in the early days of celebration, Chanukkah was actually referred to as Second Tabernacles. The Holiday Today. Chanukkah is now observed by lighting the nine-branched Chanukkah menorah each night. The center candle called the shammash (lit. 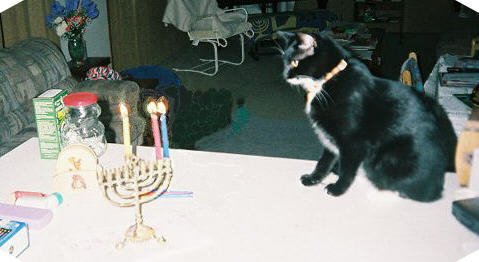 servant) is lit first and then is used to light the others, adding one new candle each night. Other customs include spinning the dreidel (a top with Hebrew letters on the sides), eating "oily" foods like potato latkes (pancakes) and sufganiyot (jelly donuts), plus giving Chanukah gelt (coins) to children. ©2006 by Kat-Renée Kittel. All Rights Reserved. Please be kind and give credits to author and founder of the Laughter Safety Valve Commission™. Thanks. I received a very special early Hanukkah present... The gift of a friend's smile. Thank you and thanks for any future teasing...(turnabout's fair play)...and especially thanks for being an original and not a lemming. Why I'm Fond of Richard Belzer.